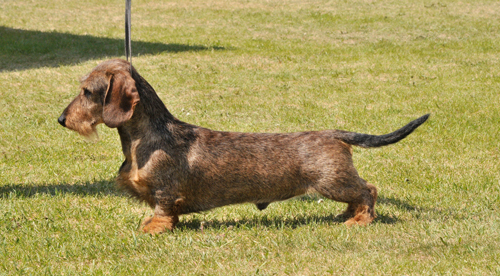 I was attracted to the Standard Wire-haired Dachshund breed after seeing a few of them at dog shows. Researching, I found they are odourless, hardy, vigorous, affectionate and responsive. They are companionable, hilarious in play, alert watchdogs and intrepid hunters. We acquired our first standard wire-haired dachshund, Hickory, in 1990. At the time we were exhibiting and breeding Japanese Akitas and wanted a smaller dog to take to shows as well as to have a housedog that didn't trigger one son's allergies. Matsutake Kennels was registered as my kennel name over 30 years ago. It was permanently registered a few years later at a time when CKC rules stipulated that the owner had to have bred a certain number of dogs that became Canadian Champions. We don't count the number of Champions we've bred or owned, and we like to follow the lives of dogs who leave our home thus though we've had requests, we haven't sent dogs overseas. My first time in the ring at a CKC show was in 1964 with my beagle. More than 40 years with purebred dogs has given me the opportunity to enjoy them as well as several wonderful "mutts" who have been a part of my life. My grandfather Eric competed with his spaniels in field and conformation almost 70 years ago and as I was growing up taught me how my life would be benefited by including dogs in it. So animals and especially dogs, have been an important part of my life for as long as I can remember. A dog has been beside me through good times and bad. My husband Hal and our extended family have participated in many ways with the dogs. Their help in socializing, cuddling, emergency vet trips, whelping and caring for litters, kennel construction....and the list goes on, has been invaluable to me and the dogs. Rocky, Nehwa, Hickory, Moppit, Montel, Cricket - so many more, and so many wonderful memories.